San Blas Islands, Panama - Tropical Paradise or Not? San Blas Islands – Tropical Paradise, or Not? When I decided to hop on the bus from Costa Rica’s capital to Panama City and endure another tortuously long bus ride I had convinced myself that the relaxing breeze and white sand beaches of the San Blas Islands would make it all worthwhile. What was in store for me was an adventure that was far from the relaxing island getaway I’d imagined. You’ve probably heard how amazing the islands are from other blogs, but now it’s time to share the not so perfect experience that might await you. 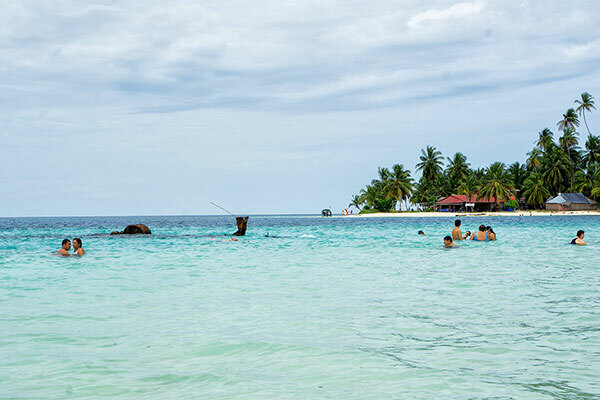 The roughly 365 islands making up San Blas are for all intents and purposes their own little country; governed not by Panama but by the indigenous Kuna Yala people who have inhabited these islands for hundreds of years. If you’re anything like me, this information only adds to the mystique and allure of visiting. The Kuna (also referred to as Guna) Yala have their own unique culture, customs and laws. In fact you have to present your passport when entering and exiting the islands from the rest of Panama. All businesses, accommodations, boats and tours are owned and operated only by the Kuna people themselves. Any outside tour operator is basically a middle man that connects you with them. After arriving in Carti we met our Kuna guide, lugged our bags onto a small boat and took off. After a short ride we stopped at our first island – a Carti village, one of the ‘community’ islands many people live on, and where the young kids go to school on. Huts and small homes have been built onto every available square foot of the island. We ended up walking right into the middle of a school parade in which the children were dressed up in trash, as some sort of recycling awareness exercise. One that is much needed as the shores of this island were home to heaps of unsightly rubbish. My San Blas experience was not off to a great start but I remained optimistic that good things were to come. Another 15 minute boat ride and we arrived at Hook Island, a small picturesque island with a few stick huts, tents and dozens of palm trees. It appears there are around 10 people living on the island and a total of 8 tourists; myself and my friend included. Dark clouds creep through the sky as we unpack and settle our things. The Kuna guide rushes us back to the boat, it’s time to visit another island for snorkeling and volleyball. I hop in the boat assuring myself we’ll be heading to one of the islands in the opposite direction of has now become a very close and large storm. Nope… the boat zips off full speed ahead – straight into the belly of the storm. Wind gusts and the fresh drops of rain begin sprinkling in. Thunder booms and flashes of lighting are seen straight ahead. The sprinkle quickly develops into a full blown downpour; the boat’s little fabric roof be dammed everyone in the boat is soaking wet and shivering cold. What the hell have I gotten myself into? Will we even survive the storm we’ve driven this little boat into? I hope everyone aboard knows how to swim! After an eternity we arrive to the next island, which is nothing more than the size of half a football field and has exactly one hut on it… 30 people are crammed inside trying to stay dry but the tattered blue tarps stringed up as a roof are failing miserably. After an hour the storm passes and we all do our best to warm up – no dry towels are provided. We headed back to our base for the night and the guide simply left us. A small meal of fish and rice was provided. Any beverages such as water or coke are $2 USD each. The Kuna hosts appeared to be completely disinterested at our presence and have interaction; leaving our group of international travelers to mingle among ourselves. Thankfully someone brought along alcohol and before long we’re all playing drinking games and joking about the less than perfect events of the day. Well into the night everyone has become inebriated and were all having a blast. Eventually even the Kuna couldn’t resist cracking a few smiles and participating in the fun. The following morning came with a hangover and one of the most beautiful sunrises I’ve seen. Then more rainfall. Our guide arrived late in the morning and as the storm clouds disappeared as suddenly as they’d arrived we headed out to Dog Island (Isla Perro). With bright, clear skies and the sun finally shining we snorkeled at a shallow rusty old shipwreck located just feet from the beach. Unfortunately the provided snorkeling masks were all in dire condition and barely usable making the activity not so pleasant. Back in the boat we stop at a shallow spot in the ocean (2-3 feet deep) where starfish are all around. Everyone snorkeled around and excitedly picked up starfish. Next we visited Pelican Island (Isla Pelicano) where several other groups were snorkeling and enjoying the good weather. Of course our luck didn’t hold out and afternoon storms returned right as it was time to leave. We had another wet, freezing and long boat ride back to the mainland while dodging flashes of lighting around us. Our new 4×4 driver back to Panama City was much better than the first one, which leads me to believe we must’ve just got the worst driver in all of Panama on the way in. Needless to say my journey to San Blas hadn’t gone quite as I’d imagined. But if I had to chose I’d do it all over again. One important thing to remember about traveling is that things don’t always go perfectly, especially the weather. But with the right attitude and right company, you can still have a good time. The 4×4 jeep ride there is often cramped and late to pick you up. 2-3 hour long ride. The main village is dirty and polluted. The Kuna people are not necessarily excited to see you, they just tolerate you. No hot water or running water, maybe not even showers on the island you stay. Bring lots of snacks & beverages, the provided meals are not enough and buying extra is very expensive. Their snorkeling equipment is awful and unusable, bring your own! No towels are provided, bring your own in a waterproof bag. Bring a deck or cards or a book in case of bad weather – they don’t provide entertainment. Although single day tours can be booked I would strongly advise against this – you’ll spent nearly the entire day driving there and back rather than on the islands – and if you get bad weather like we did, it will be for nothing. Get the experience of spending at least one night on the islands. Aww bummer about the weather! It stormed for one day when we were there but luckily we still had some good weather. And yes, I agree with you about the trash, we were sad to see Carti with lots of trash. But I’m happy to hear that your trip still turned out well despite some things gone wrong or some disappointments, a good attitude goes a long way. Stunning sunrise photo, I don’t ever get up early enough for sunrises haha. Ah what a bummer. At least you managed to get some beautiful sunrise pics in and hang out with a few enjoyable people. I had heard good things about these islands from a family travel blog who had done a sailing trip there (can’t remember the name). Maybe it’s better to stay onboard a boat…. although not in a storm! Oh I totally agree with that sentiment!! EXACTLY! Well done.. we send our clients that whole story (our version) so they know exactly what to expect on those ‘backpacker’ tours.. And we end up booking many more on flights to SPECTACULAR islands with ‘en suite’ cabins or even have them stay on some real nice catamarans! And it’s a bit remote, I guess… but gaining a lot of spotlight recently. Hi James. Glad you still managed to have a nice time despite of. I will be traveling to Panama next month and plan to stay in San Blas Island for couple of nights. Been researching online on budget accommodations but have not decided yet. Which island did you stay? Would you recommend it? Thanks for the post, quite helpful. I stayed on Dog Island, and went through Panama Travel Unlimited. Luna’s Castle Hostel is a cheap place to stay in the fun Casco Viejo area in Panama City; they help organise budget trips to the Islands also, and have some good info here. Hope the weather cooperates and I’m sure you’ll enjoy it!